What is Hip Joint Replacement? Osteoarthritis: wear and tear leads to damaging cartilage covering at ends of the hip bones that allows it to move smoothly. Rheumatoid Arthritis: an inflammation that erodes bone and cartilage and deforms joints, due to the immune system. Osteonecrosis: deficiency of blood supply to the ball of the hip joint causes bone to deform and collapse. Limits everyday activities like walking, bending, getting up from a seated position, climbing stairs etc. Stays even while resting or sleeping even at night. Patient will be prepared for the hip joint replacement surgery by taking blood tests, ECG or X-ray, for a safe surgery. Donation of blood prior to surgery is recommended, to be used if needed. Inform the doctor of the medications and supplements, you are presently taking. The doctor will decide on the hip implant, which consists of the ball component, made of strong metal or ceramic and the socket component, a durable cup-shape made of plastic, ceramic or metal with an outer metal shell. The surgeon will begin by making incisions or cuts in the front side of the hip through layers of tissue. The diseased and damaged bone and cartilage is removed, leaving the healthy bone intact. The prosthetic socket is then implanted into the pelvic bone, replacing the damage socket. 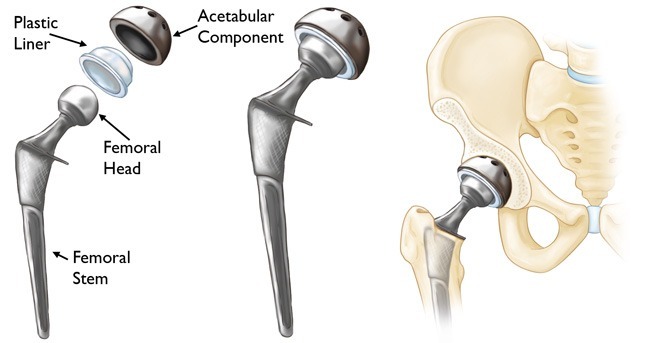 The round top of the femur is replaced with the prosthetic ball that is then attached to a stem that is fitted into the thighbone. The patient usually can leave the same day itself for recovery after a couple of hours, after monitoring the vital statistics.